The PW201A Powerline Wireless N300 Extender uses the existing electrical wiring at your home to create a wireless network. It also extends your powerline network to every corner of your house without the mess of cables. Compliant with Homeplug AV and IEEE802.11n standards, this powerline adapter transforms every electrical outlet into a high speed wireless network of up to 300Mbps to access computers, smartphones, game consoles and other WiFi-enabled devices throughout your home. No drilling, no wiring! 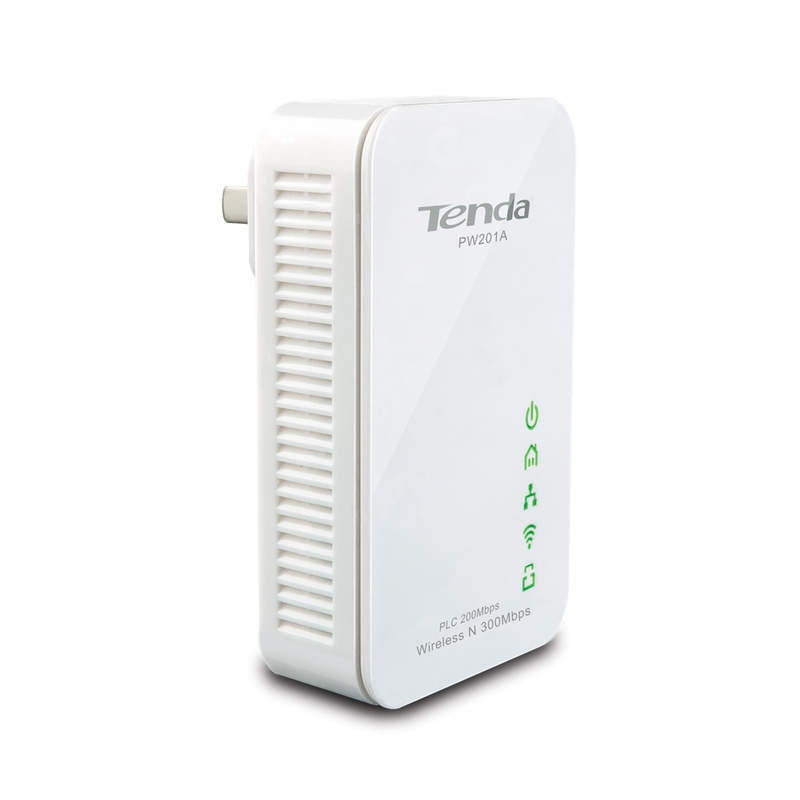 With the Tenda PW201A, you can build your wireless network with minimum effort and cost. It's ideal for use in the living room and the home office. The PW201A enables you to build a wireless network with minimum effort and cost. It extends the Internet connection to every room of the house from your broadband router using the powerline. No more problems with thick walls, WiFi in every room and on every floor of your house. Just plug a Powerline device that links to a broadband router into the power outlet in one room, and plug the PW201A in any room desired, you can then easily and instantly create a high speed wireless network for sharing by multiple users. With Powerline and Wireless N technologies, the PW201A provides users the stable and high-speed Internet access, delivering data transfer rate up to 200Mbps over electrical wires and up to 300Mbps wirelessly. So you can stream high definition video, enjoy lag-free gaming and faster access to large files within your network. The PW201A provides QoS feature that prioritizes Internet traffic, ensuring bandwidth-sensitive applications like HD movie, gaming, IPTV, and VoIP do not experience glitches while web surfing and downloading are in progress. This device is designed with fashion and style. It is not just a network device but a gadget that fits perfectly to the surroundings in the living room or home office.